Our recent renovation and expansion project incorporated "green" elements such as photovoltaic cells, solar hot water panels, efficient heating, cooling, and electrical systems. In addition, we capture storm water into an onsite "rain garden" and into old copper tank that had been in our basement for decades. This tank was repurposed and retrofit to hang on the side of our building and collect rain water from our roof. The water is then used for landscaping maintenance. Our focus on the environment also includes the use of "green" cleaning supplies and reduction of paper waste. You won't find paper towels in our bathrooms, but rather air driers. You will find reusable ceramic coffee mugs and plastic drinking glasses in our dining room and kitchenette areas, instead of paper products. Only low VOC (volatile organic compound) paint and floor coverings are used through the building, which improved indoor air quality. 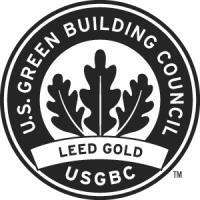 We are honored that we have received LEED Gold Certification. CLICK HERE to see how much energy we generate with our photovoltaic cells! 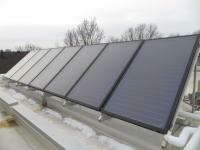 Our rooftop solar cells heat most of the domestic hot water we use throughout the building. We have attained Gold LEEDS (Leadership in Energy & Environmental Design) certification. 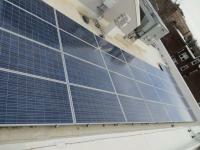 Our rooftop photovoltaic cell system produces most of the electricity we use!